Add N6-methyladenosine (m6A) monoclonal antibody - Classic to my shopping cart. Request a quote for a bulk order for N6-methyladenosine (m6A) monoclonal antibody - Classic. Please fill out the form here below. Your local sales account manager will get in touch with you shortly and send you a quotation based on your requirements. 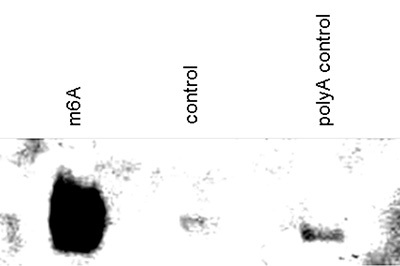 Monoclonal antibody raised in mouse against N6-methyladenosine (m6A) conjugated to BSA. Protein A purified monoclonal antibody. Store at -20°C; for long storage, store at -80°C. Avoid multiple freeze-thaw cycles. * Please note that the optimal antibody amount per IP should be determined by the end-user. We recommend testing 1-10 µg per IP. RNA Immunoprecipitation was performed on 40 µg HeLa total RNA spiked with 0.5 µg of an in vitro prepared transcript containing 6mA nucleotides, using 2 µg of the Diagenode monoclonal m6A antibody (cat. nr. C15200082). An equal amount of IgG was used as negative control. The immunoprecipitated RNA was subsequently analyzed by qRT-PCR with primers specific for the transcript and for an intergenic region, used as negative control. Figure 1 shows the recovery, expressed as a % of input (the relative amount of immunoprecipitated DNA compared to input DNA after qPCR analysis). Immunoprecipitation was performed on two radiolabelled synthetic DNA oligo’s, a 250 nt oligo containing m6A nucleotides and a 350 nt unmethylated control, using the Diagenode monoclonal m6A antibody (cat. nr. C15200082). The immunoprecipitated fraction is shown in lane 3; lane 2 shows the non bound fraction, whereas the input is shown in lane 1. 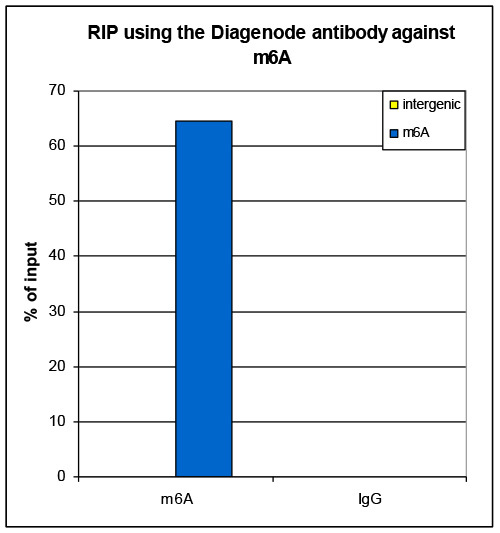 To demonstrate the specificity of the Diagenode monoclonal antibody against m6A (Cat. No. 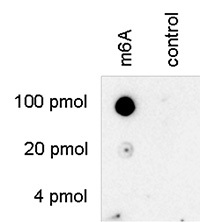 C15200082), a Dot Blot analysis was performed using an m6A containing, a non-methylated control and a non-methylated polyA control synthetic RNA oligonucleotide. Dot Blot analysis was performed using a synthetic DNA oligonucleotide containing different m6A modified bases and a negative control. 100 to 4 pmol of the respective oligo’s were spotted on the membrane. 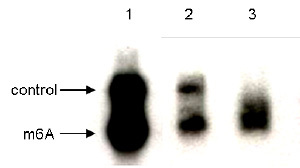 The antibody was diluted of 1:500 in TBS-T containing 10 % skimmed milk and 1% BSA. Figure 4 shows a high specificity of the antibody for the modified oligonucleotide. Diagenode strongly recommends using this:	N6-methyladenosine (m6A) monoclonal antibody - Classic (Diagenode Cat# C15200082-50 Lot# 001). Click here to copy to clipboard.